He's wearing the embarrassing head cone. But he's being a good sport about it. This is what it looked like before the doctor (on both armpits!!) - it's already looking better! And, I didn't want to leave out poor Zeus. He is not loving his brother with the cone because he has no one to play with! another blogger, Carolina Charm, mentioned that she put her dog on a grain free food and has seen a big difference! Maximus doesn't just have itchy skin - he got a full on bacterial infection under his armpits. That's why he was itching so bad. But... both he and Zeus are just itchy, so hopefully the supplement and weekly baths will help him out. He's on 2 different antibiotics and a topical spray, but he is already looking much better (minus the cone). PS. have you entered the PopScent fragrance giveaway?? Poor little Maximus in his cone of shame! Oh, poor little guy.. At least he's being a good sport and will hopefully heal much faster. I hope he is all healed up and cone-free soon!!!!! poor guy! 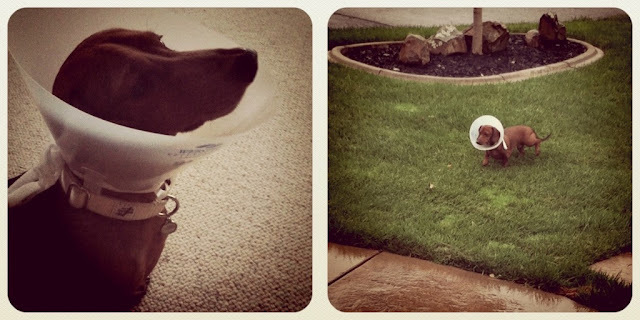 hope is infection goes away really soon...that cone of shame certainly can't be comfortable! Poor thing! Hopefully those things help him not itch as much! Oh, I am feeling so sad for the little guy! Now, I know this might sound stupid, but I just want to clarify. Are you supposed to get your pup to ingest the fish oil supplements or do you puncture the capsule and apply the oil to his itchy skin? My doxie has little itchy spells on and off and it'd be good to be get a little ahead when the next one hits. Poor Max. He's still so cute! My vet recommends oatmeal shampoo too. oh, poor thing! But what a relief to know the problem has been detected and it is being fixed! Well wishes for little Maximus!! Aww trying to cuddle with that cone just seems so hard. I should probably use oatmeal shampoo on my pup. He's always scratching. How awful would it be to have a damn cone on your head??! I always feel so bad when dogs have to wear these. Runnin' into everything in sight. Poor baby!! oh my goodness he is adorable (sad that he has to wear it, but adorable at the same time). hope he's better soon! My dog had to have one of those as well...I hope your doggie gets better soon! Awww, poor Maximus! So cute though! My Lucy is half dachshund, and has the EXACT same problems under her arm pits. After I saw on Twitter that you started Maximus on fish oil, I did the same thing for Lucy. Our vet had previously diagnosed it as a bacterial infection, but even after meds, nothing cleared up. I bathe her weekly & still had same results. She's only been on the fish oil supplements for a few days, but I'm hoping it will help her out. She is super itchy! I'll tell her she's not the only pup with pitty problems! Ooooh poooor wittle Maximus!! Get better buddddy!! No shame in the cone! Daisy May has sported the tarp TWICE now haha. We send our lovins Max! :) I am entering this giveaway!!! Sunds great!!! Have a great weekend my little California chick!!! Awwww, poor little guy!! The cone is a pain but it usually gets the job done! I hope he gets better! He's such a cutie. Awwww poor buddy!! :( I hope Maximus starts feeling better fast! Glad it's already starting to clear up! aww poor puppy! he's still real cute. Cute pup! We have 2 doxies and love them to pieces! My pup is a golden doodle and has been wearing his thunder vest all week because he's been scratching and licking himself raw on his belly. Apparantly... tis the season! What a cute pup you have!